Sculptor Jocelyn Russell with the maquette of her Secretariat sculpture. A new sculpture of Triple-crown winning legend Secretariat will soon grace an intersection in his home town of Lexington in Kentucky. The life-plus-half size bronze sculpture by Jocelyn Russell of Secretariat running in the 1973 Kentucky Derby with jockey Ron Turcotte aboard is expected to be complete in the autumn of 2019. The work that is to be erected in the centre of the roundabout at the intersection of Old Frankfort Pike and Alexandria Drive was commissioned by the Triangle Foundation, a Kentucky organisation that supports projects that promote the Bluegrass region’s rich heritage. A preview of the statue will be on display at a public unveiling of a one-fifth size maquette at Cross Gate Gallery in Lexington on October 12. There, Russell will be joined by Kate Chenery Tweedy, daughter of Secretariat’s owner, Penny Chenery. “The statue was one of the last projects approved by Mom before she died and as a longtime resident of Lexington along with Big Red, who stood at nearby Claiborne Farm, she would have been thrilled to see such an important civic undertaking come to fruition,” Tweedy said. 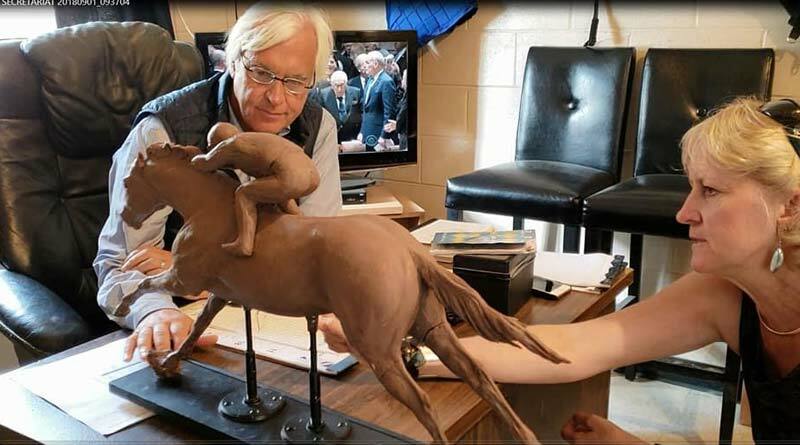 Thoroughbred trainer Bob Baffert looks at Jocelyn Russell’s work in progress of Secretariat. This year is the 10th edition of the Secretariat Festival, which celebrates the life and legacy of the 1973 Triple Crown champion. The maquette will also be on display on Saturday, October 13, from 9am to noon at The Thoroughbred Center at 3380 Paris Pike, during the Festival’s events. Jocelyn Russell is known for her animal sculptures at the Audubon Zoo in New Orleans and her statue of Korean War horse Sgt. Reckless that recently debuted at the Kentucky Horse Park. Triangle Board Chairman Edward Barr said that as the Derby’s fastest champion, Secretariat exemplified the importance of the Thoroughbred racing and breeding industry to central Kentucky. What a beautiful statue for the magnificent Secretariat.